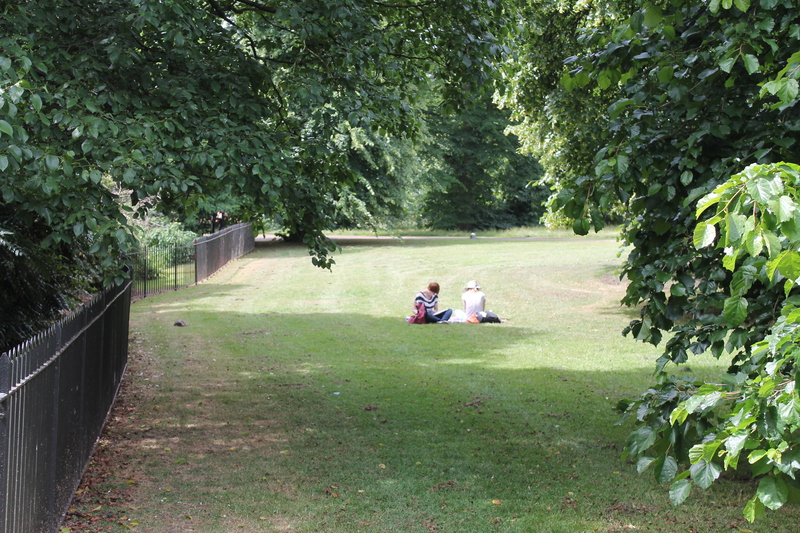 What do you do on a hot July day when you want to be near a park and some water? 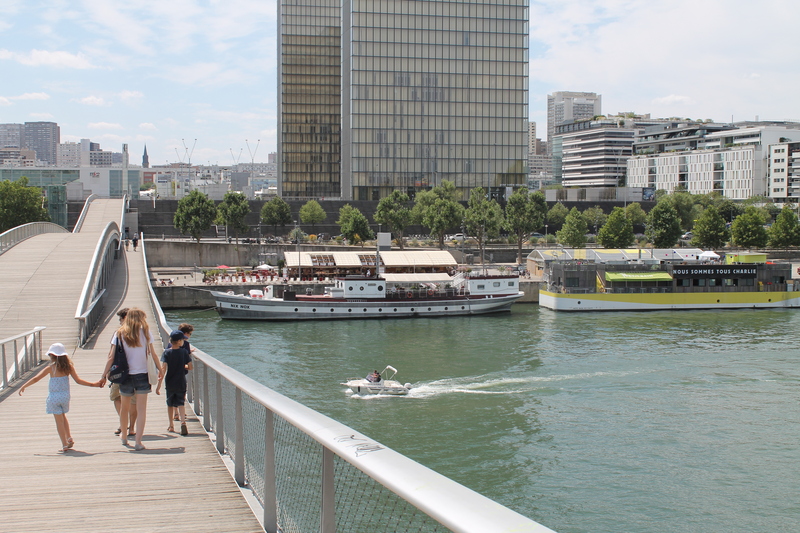 Why, go to Bercy, of course! 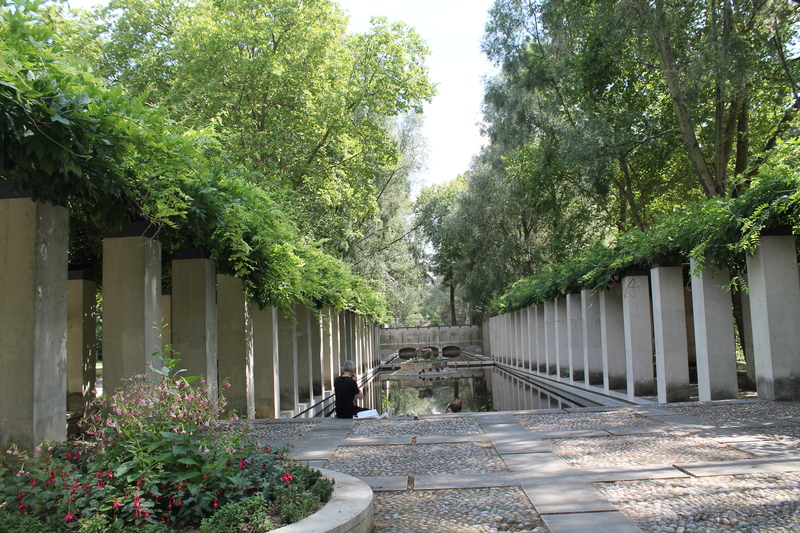 I discovered Bercy Park (Parc de Bercy) a few years ago and love it for its elongated lawns, diverse gardens and close proximity to the river Seine. 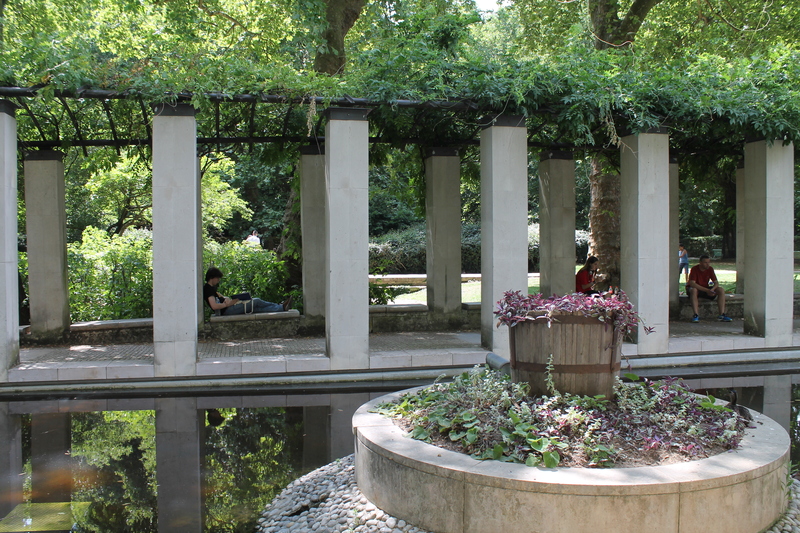 Midway through the park, there’s a cool and peaceful arbor overlooking a small pool. Here’s where I like to sit and write or read a book. 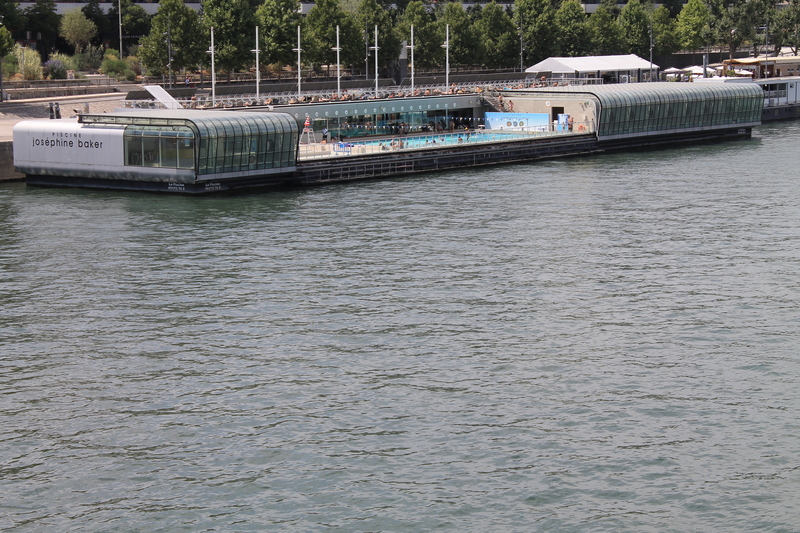 On the other side of the river from Bercy Park, there’s an open-air swimming pool called the Josephine Baker. It’s on a barge. 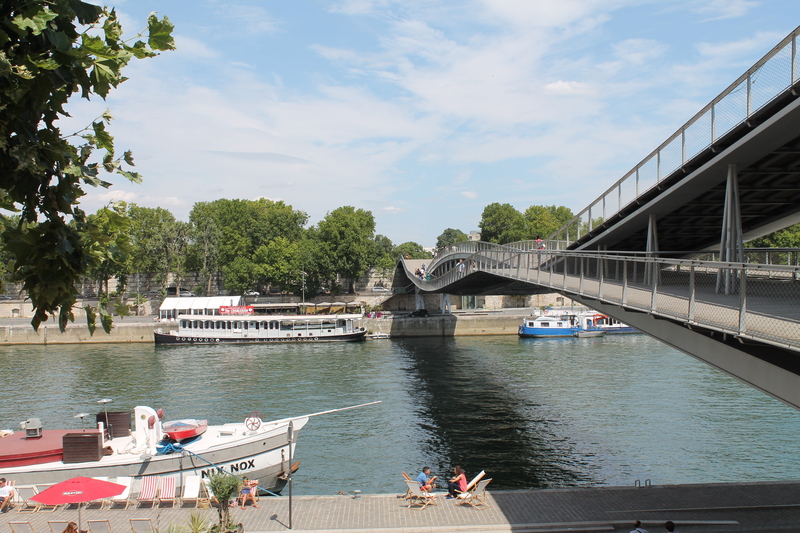 Connecting the right and left riverbanks and leading to the pool is a wide footbridge (photos up top) called the passerelle Simone de Beauvoir. 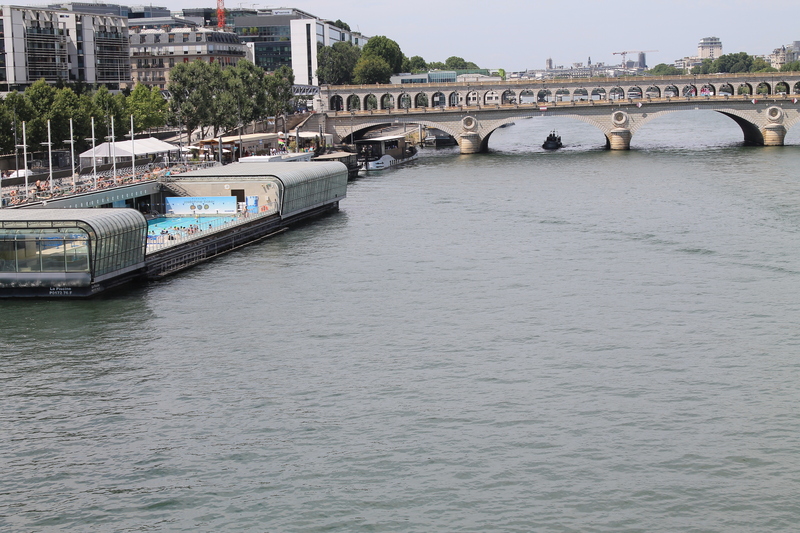 On this particularly hot day, the breeze blowing in off the river as you crossed the bridge was very welcoming. 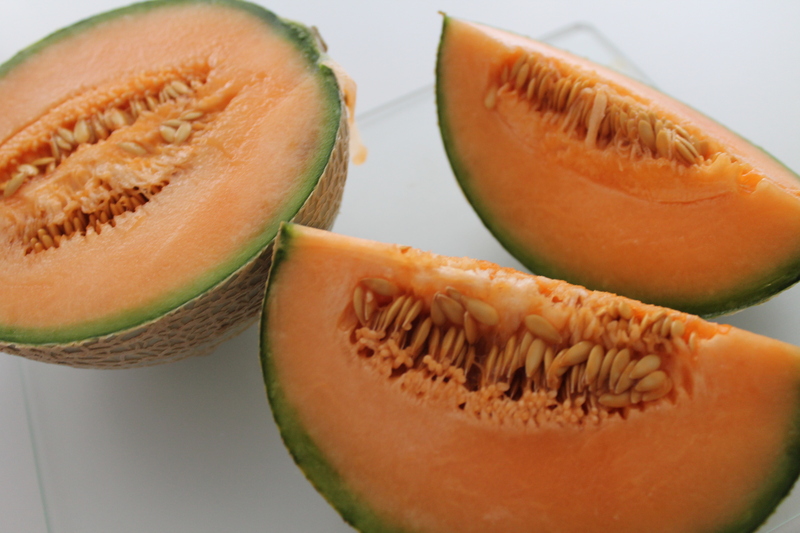 mmmmm….tastes like summer. Bye for now. According to the French Consulate, there are approximately 300,000 to 400,000 French people living in England. And I kept bumping into them as I made my way around the country’s capital. 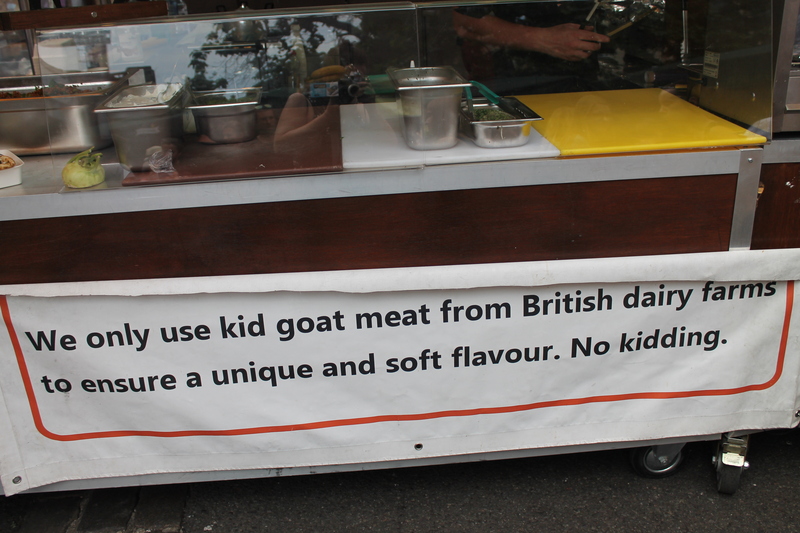 And here’s the funny thing – they’re far more friendly and garrulous in London than they are in Paris. 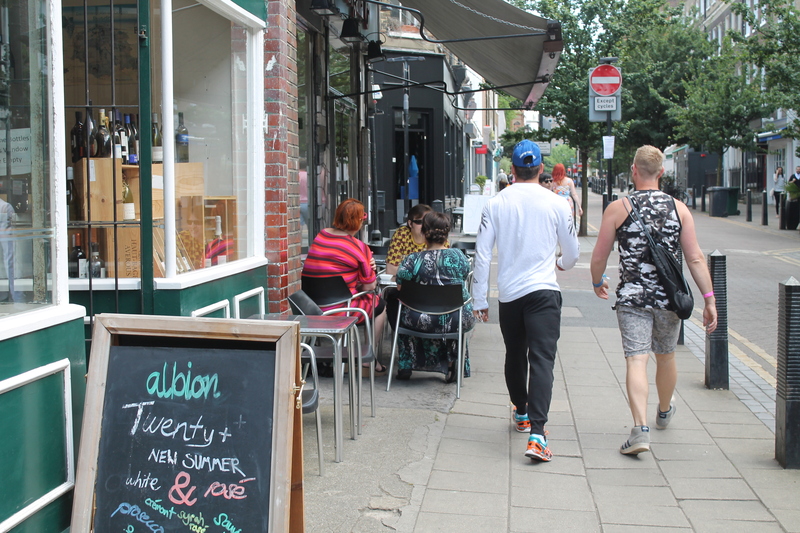 Walking along the Fulham Road one sunny morning, I spied the relatively new Whole Foods Market across the road. Starving because I hadn’t yet eaten breakfast, I popped in to have a look around. The first thing I saw was this gleaming espresso machine. I ordered a double espresso with whole milk. 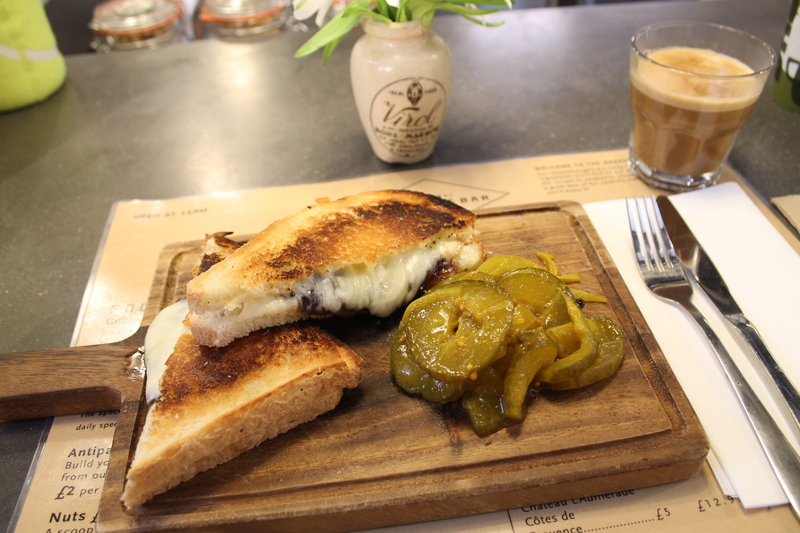 As I walked around with my coffee, I saw a bar with counter service offering charcuterie, cheese and pickles. It looked like my kind of place. I climbed onto a high stool, glanced at the menu and ordered a grilled cheese sandwich with onion chutney. And – quelle surprise – the man standing before me was a Frenchman. We chatted while I ate. 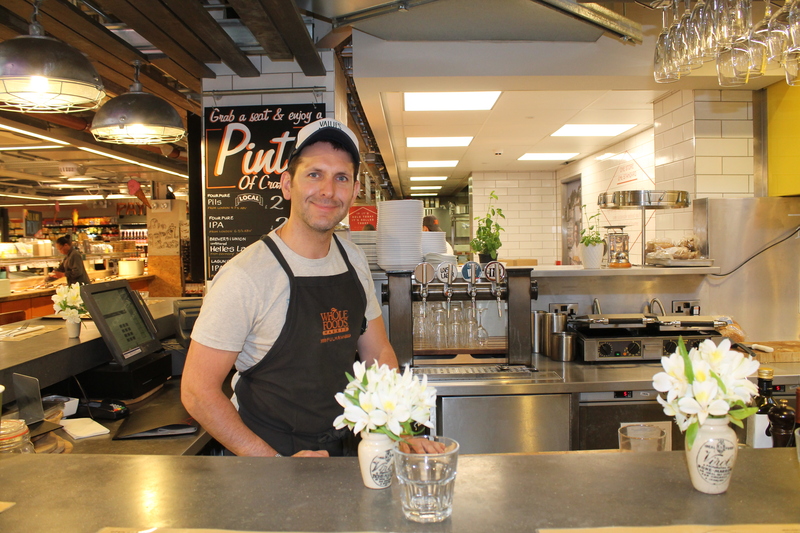 Pascal is originally from Brittany, but has been living in London for a decade and a half. Like most of the French people I’ve talked to, he’s in no hurry to return to France. By the way, the sandwich, served with pickles, was extra. Merci, Pascal ! According to a BBC article, here are a few reasons why the French stay in the U.K.
a gateway to globalization and also as a way of breaking away from stifling French bureacracy. If you want security and beautiful long vacations, stay in France. But if you’re seeking adventure and wanting to learn new skills, come to London. I pondered that last comment and decided that, at this stage in my life and my career, I preferred beautiful long vacations. But there’s no job security in France or elsewhere. Believe me, I know. Here are three French teenagers on their way to the Lycée Français Charles De Gaulle, wholly owned by the French Government, in South Kensington. 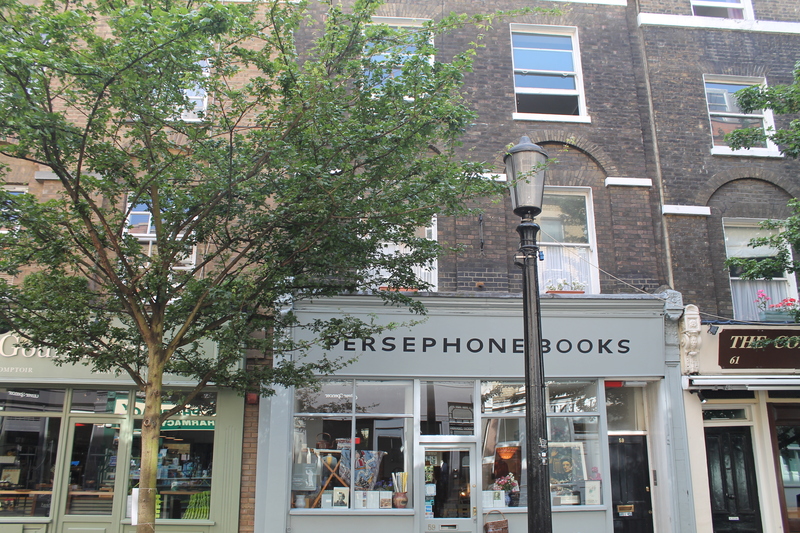 A friend of mine told me about a book event scheduled to take place in one of my favourite London bookshops. 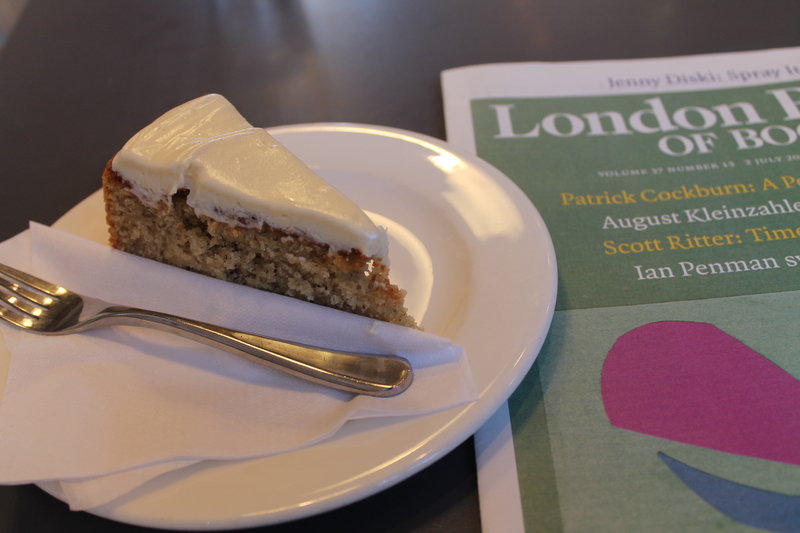 I went early for late-afternoon tea in their renowned cake shop. 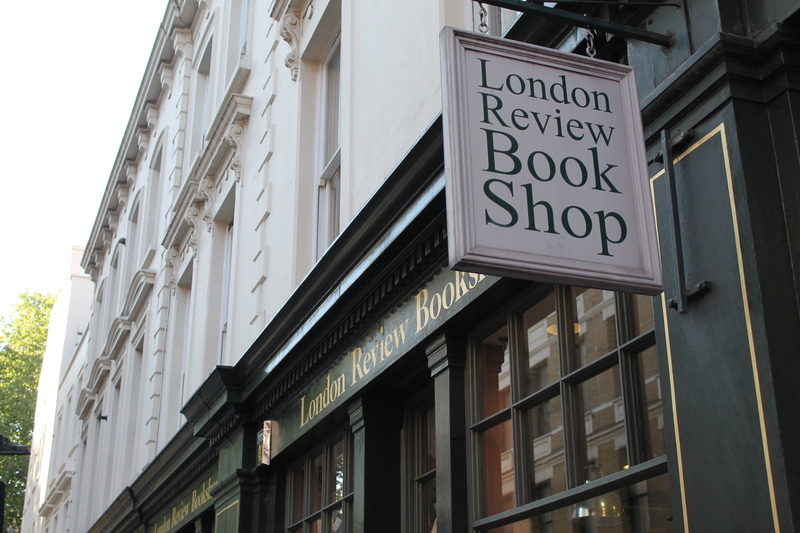 The London Review Bookshop is located in Bloomsbury, just down the road from the British Museum. 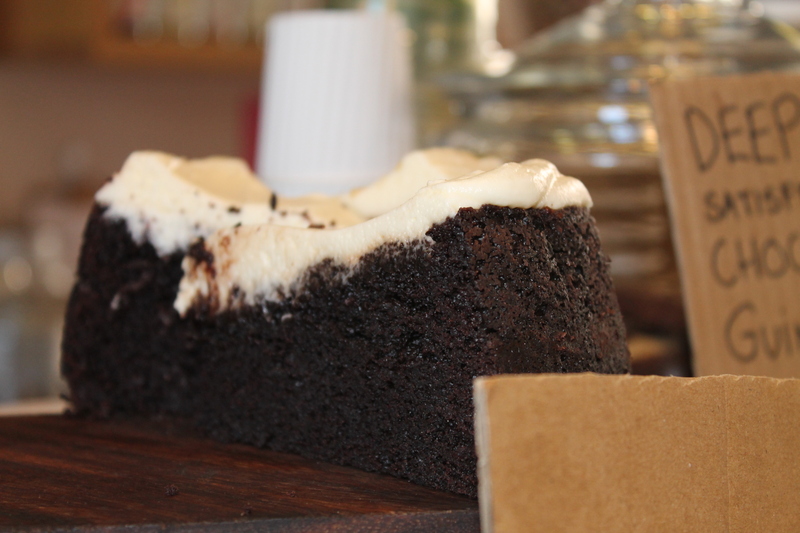 Their cakes are divine. 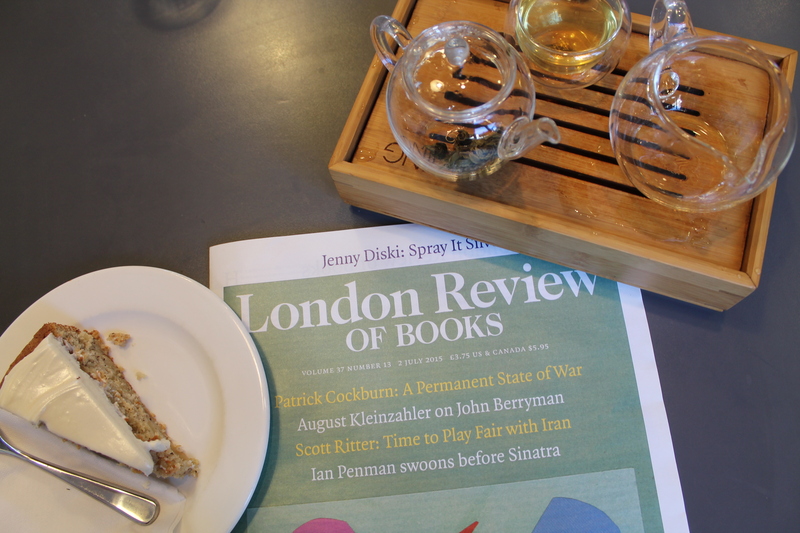 Here’s a slice of “no-wheat rose and pistachio” and below that a “deeply satisfying chocolate and Guinness” slice. Oh my! 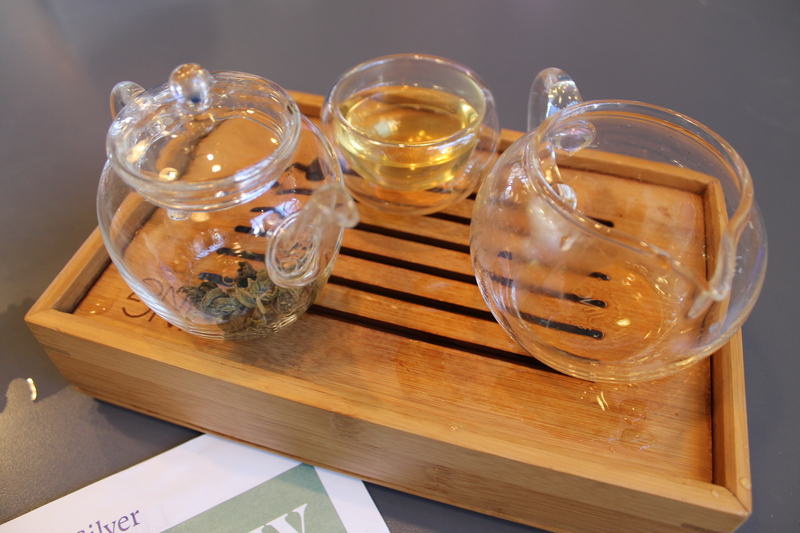 I chose Apple and Earl Grey cake served with Iron Buddha, “an intensely floral Oolong tea”. To celebrate the 150th anniversary of Lewis Carroll’s, Alice in Wonderland, Robert Douglas-Fairhurst, Professor of English Literature at Oxford University, led a talk about his latest book entitled The Story of Alice. It’s a double biography of the author Lewis Carroll and his subject, Alice Liddell. 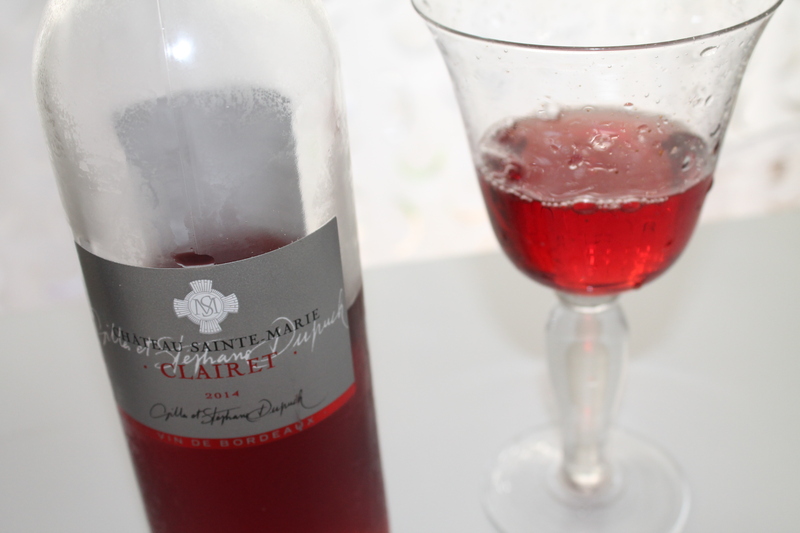 Joining him was Vanessa Tait, author of The Looking Glass House. Ms. Tait is the great grand-daughter of Alice Liddell. As you know, Alice Liddell was the real-life inspiration for Alice. Here’s Ms. Tait here, the woman standing on the left. 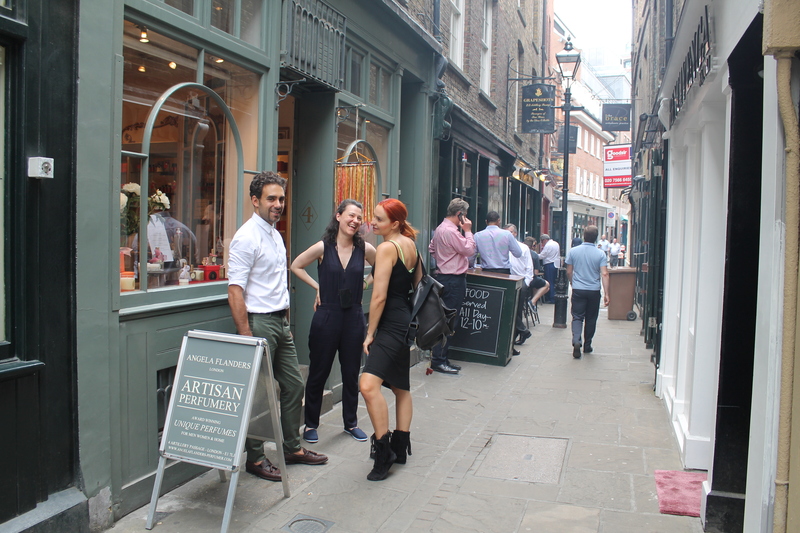 Straddling central London (The City district) and London’s East End, the Spitalfields quarter is old, historical and interesting. The problem though, as is clearly evident, is that important bits of this fascinating district are being eaten away by land developers and, as a sad result, its history is being erased. 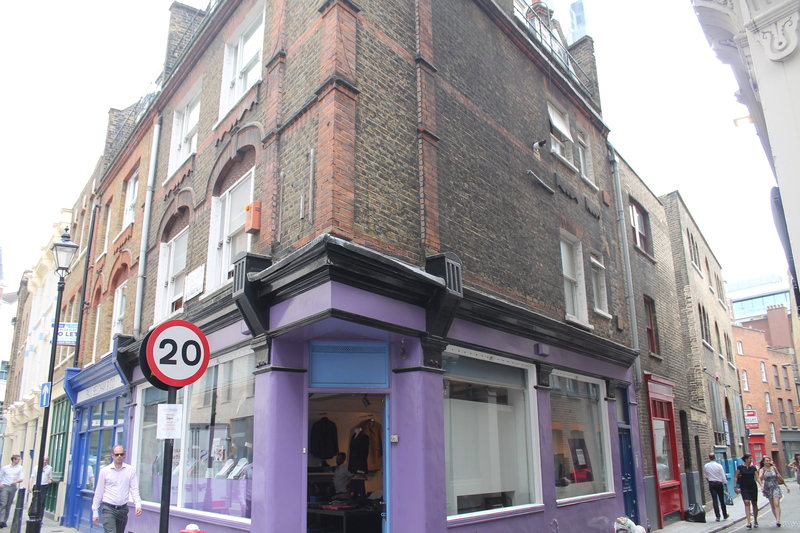 I had been talking about the subject with a staff member of Raven Row, an art exhibition centre that I had visited, located at the end of a Spitalfield’s lane. 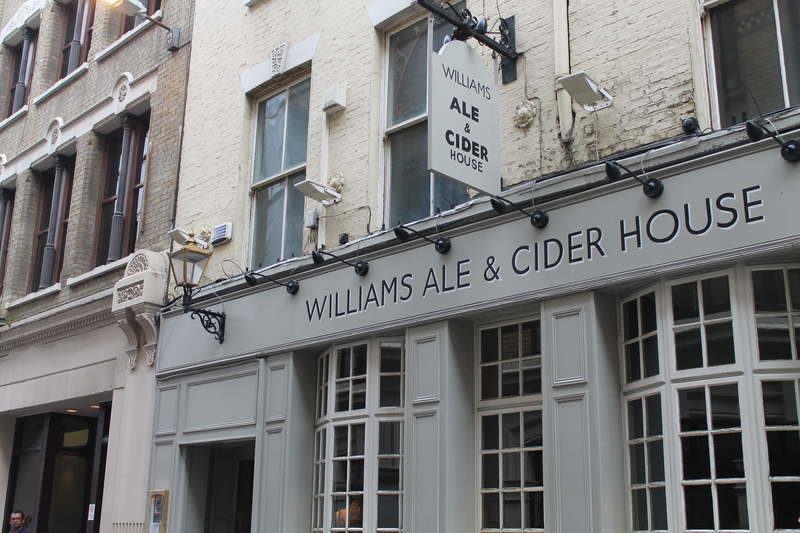 As The City (London’s financial district) expands, old brick houses, lanes and shops are being demolished to make way for soulless office towers. 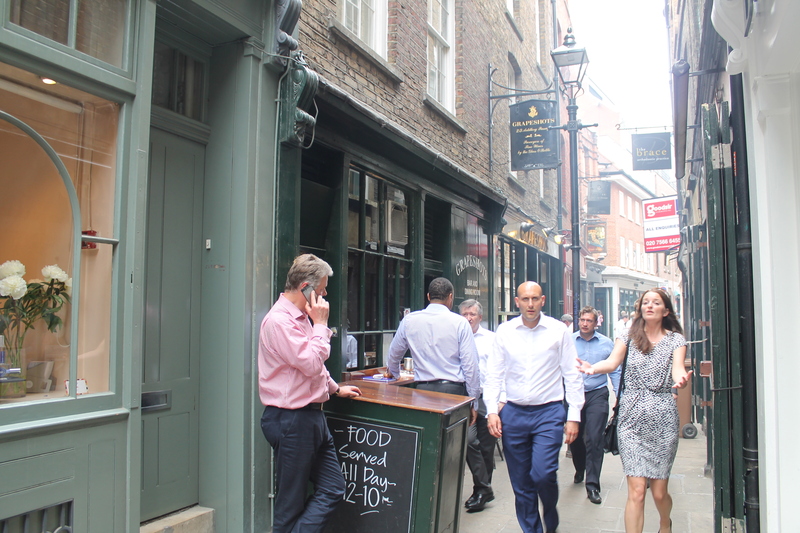 Below are a few of these narrow lanes and brick buildings. What you can’t see are the office towers that literally surround and dwarf the diminishing historical area. It makes for an odd architectural juxtaposition. Now this place is after my own heart. If I lived in London, I would be a member. If I had a lot of money, I would make a generous donation. 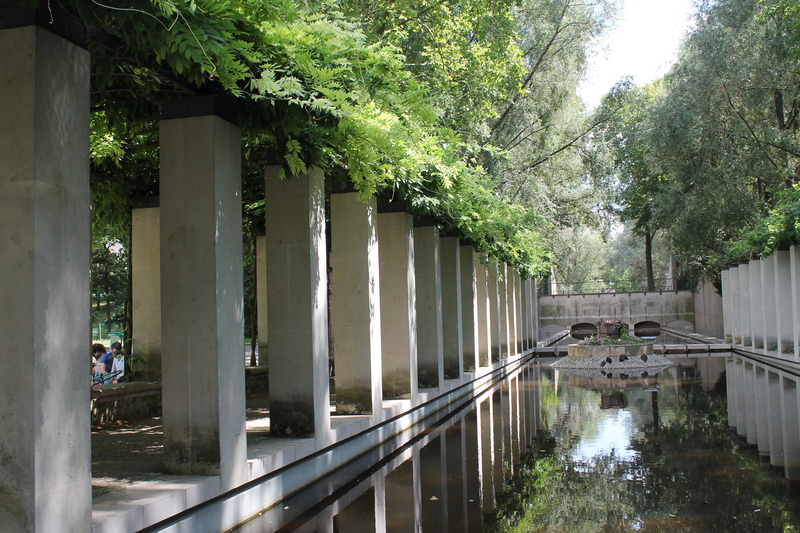 Every city in the entire world should have a place like this! 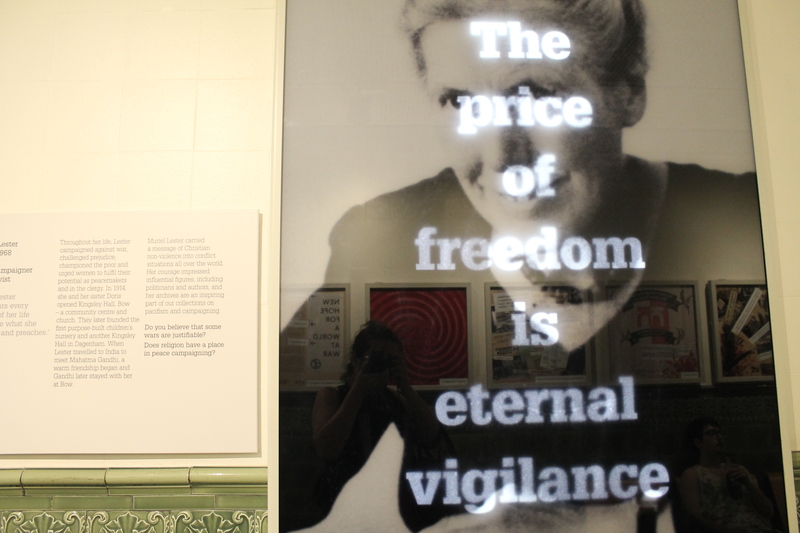 Bishopsgate Institute’s vision: Dedicated to opening minds, challenging perceptions and enriching lives. 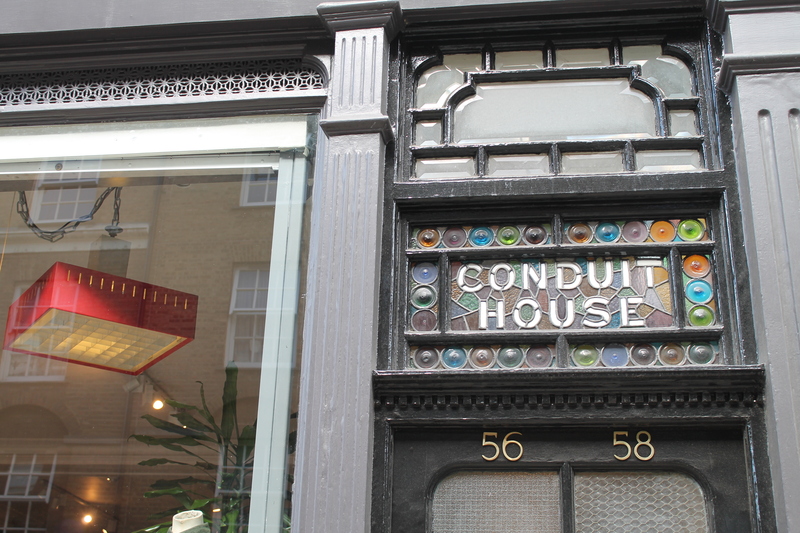 Since 1895 we have been a home for ideas and debate, learning and enquiry; a place where culture, heritage and learning meet, and where independent thought is cherished. 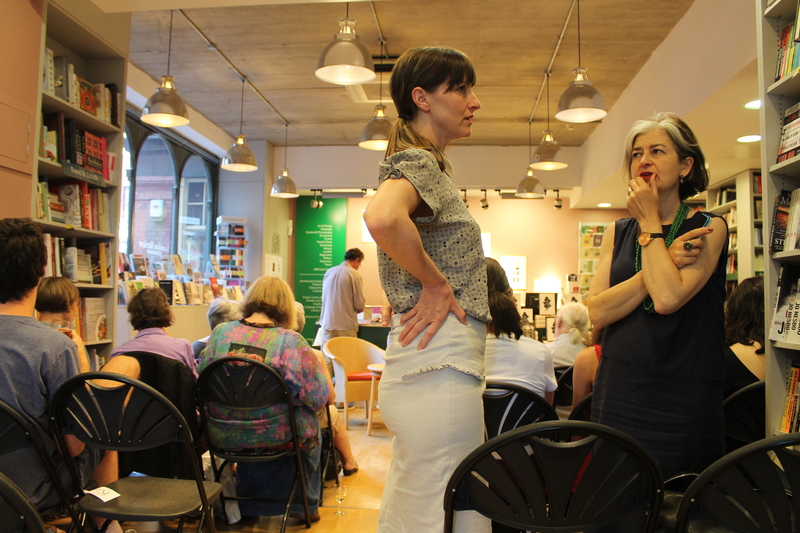 Our mission is to provide welcoming and inspiring spaces for people with a thirst for knowledge to learn and flourish. 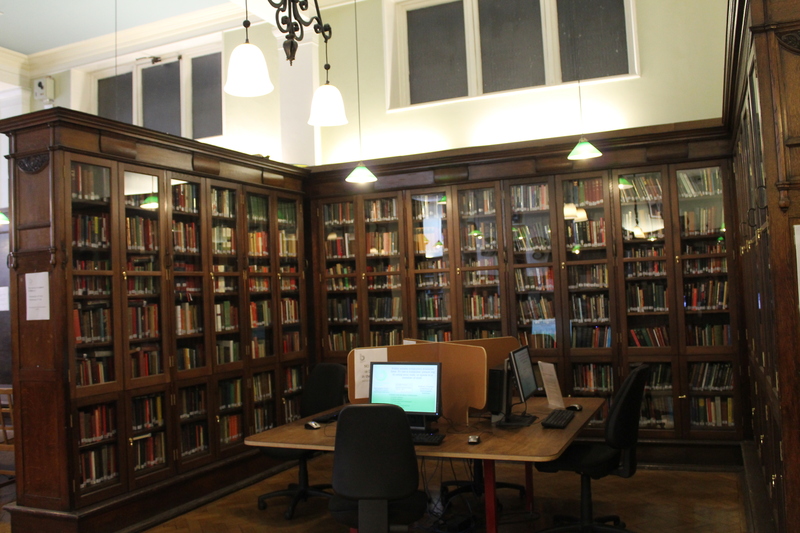 Through our library, historic collections, courses and cultural events, we enrich, entertain, and stimulate independent thought in a vibrant city environment. 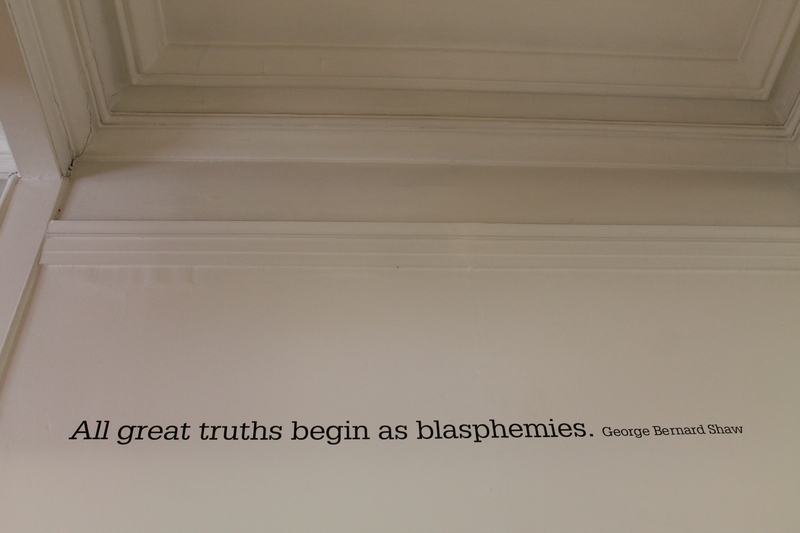 As I walked down the halls stopping and staring at the then-provocative quotes uttered by visionaries, free-thinkers, authors and activists, some from a hundred years ago, I thought how relevant and topical they still are today. 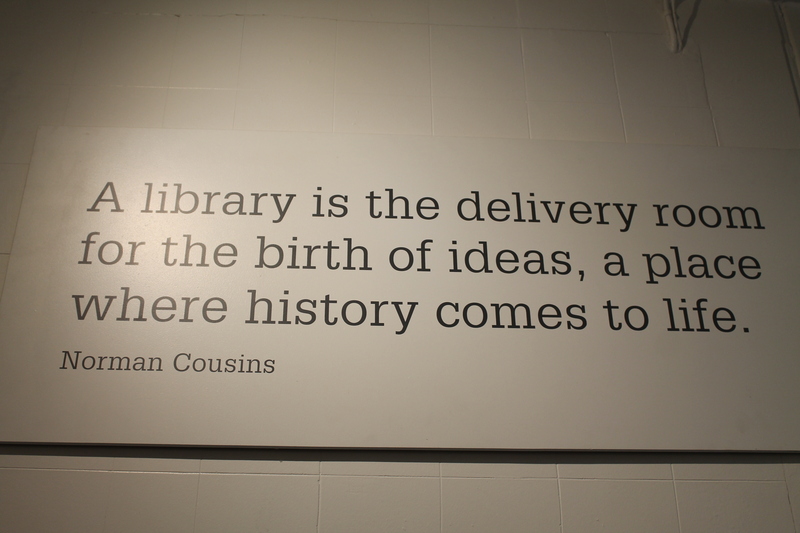 There’s a wonderful library, open to all. Seeking refuge from the heat, and also to rest my weary feet, I went into the cool, hushed interior and sat at a desk. I ended up viewing slides of mid-19th century London – landmarks, buildings, streets, social and cultural scenes. They were, in fact, old glass sides that had been digitized and transformed into a slideshow. Fascinating! I could spend hours in this place. Below is the institute’s website. Please go. Londoners reading this: please make a donation. Because what’s more important than opening minds? There are interesting lectures, courses, and cultural events. 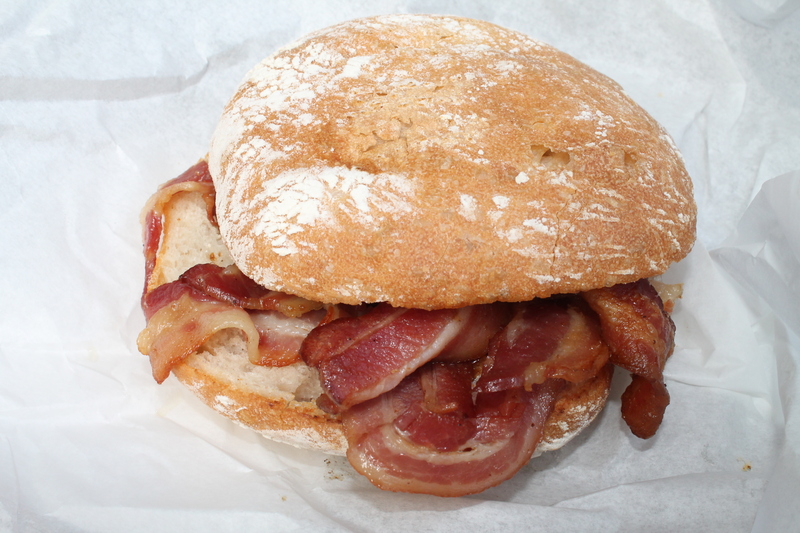 There is also a cafe on-site. A last favourite quote by Alvin Toffler – The illiterate of the 21st century will not be those who cannot read and write, but those who cannot learn, unlearn, and relearn. “My country is my world, and my religion is to do good.” Thomas Paine, 1737 – 1809, English-American political activist, philosopher, political theorist and revolutionary. One of the Founding Fathers of the United States. One of my greatest pleasures is urban walking. When I’m in a city on vacation, I usually walk 6 to 7 hours a day. But this time my knees ached, so I had to slow up a little bit. While walking I like to gaze at beautiful buildings and streetscapes. Sometimes I’ll stop in front of a building just to admire its style and character. And if it’s an old building, I try to imagine who lived there and what it must have been like a hundred or a hundred and sixty years ago when horses and carriages were parked out front instead of cars. 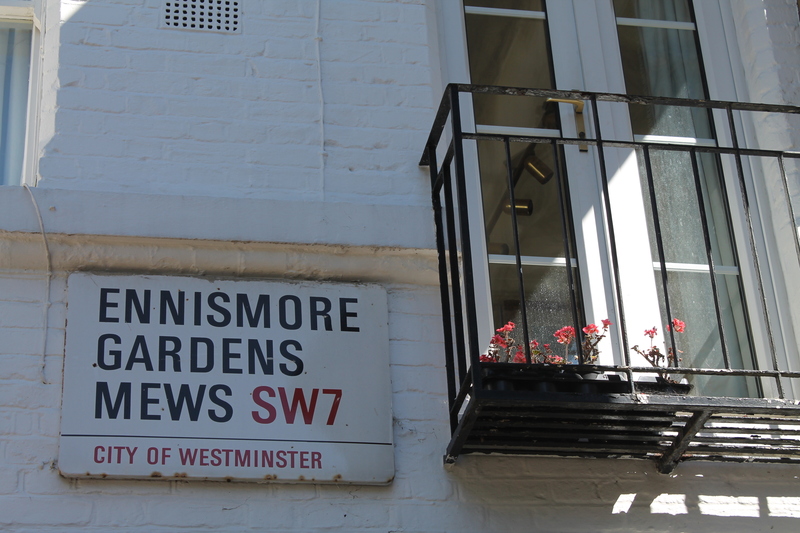 Ennismore Gardens is one such place, a gorgeous square I stumbled upon while exploring South Kensington. Intrigued by the beauty and history of the square, I did a bit of research and came up with the following. In the late 19th century, the first residents were aristocrats and statesmen; in the 20th century they were joined by artists and actors. 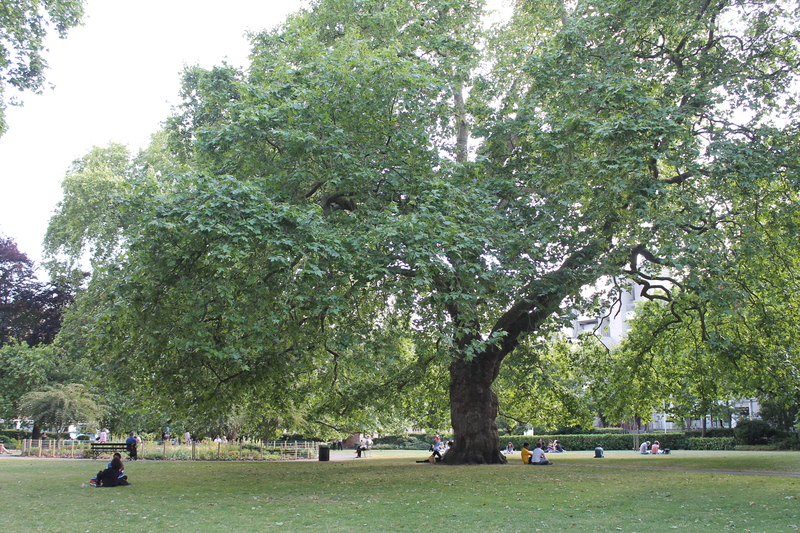 Development began in the 1840s and decades later the rest of Ennismore Gardens, including the private garden square at its centre, was laid out in the 1870s. 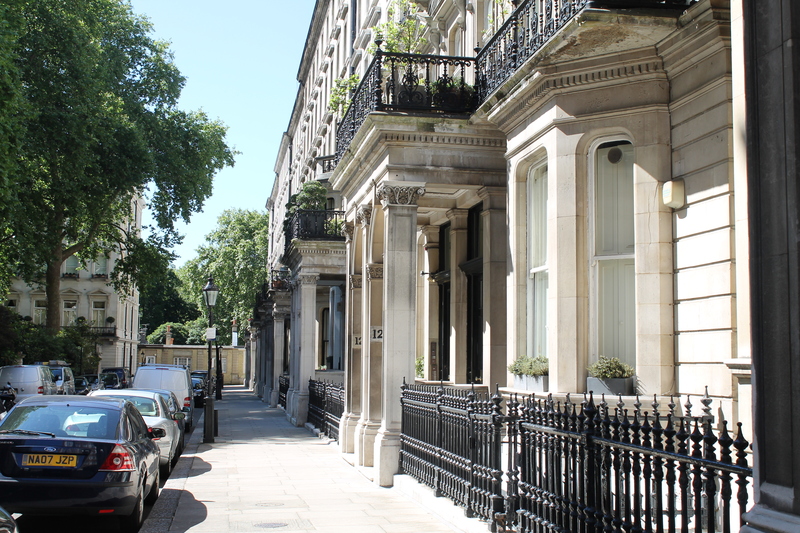 The five-storey houses, referred to as “town mansions”, have porticos with Corinthian columns and a continuous railing creating a first floor balcony. Of course in those days each house was occupied by one single family and its domestic staff. 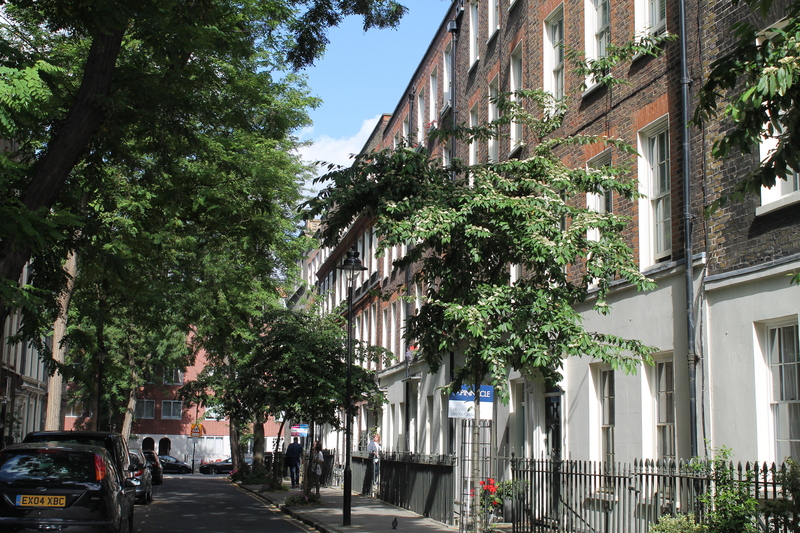 But throughout the first five decades of the 1900s they were gradually converted into apartments. You can’t really appreciate the grandeur of this square by these photos. 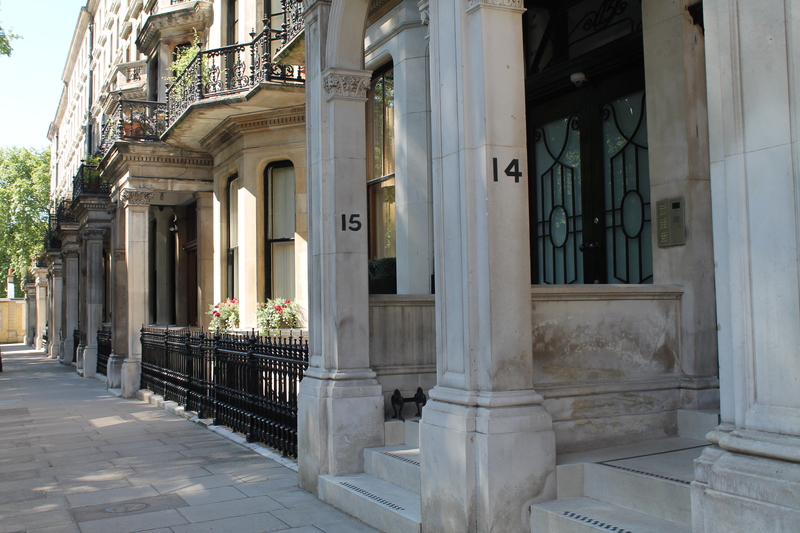 Ava Gardner lived at 34 Ennismore Gardens until her death in 1990. 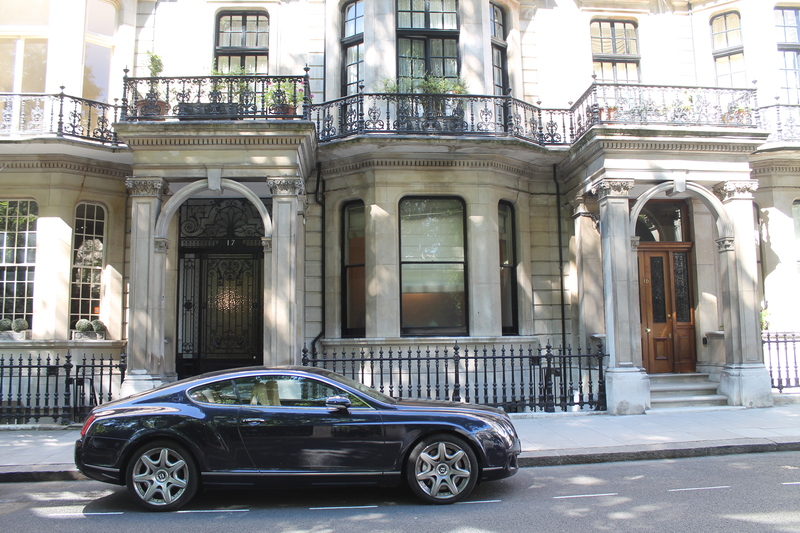 In 2011, the average house price in Ennismore Gardens was £3,345,000. 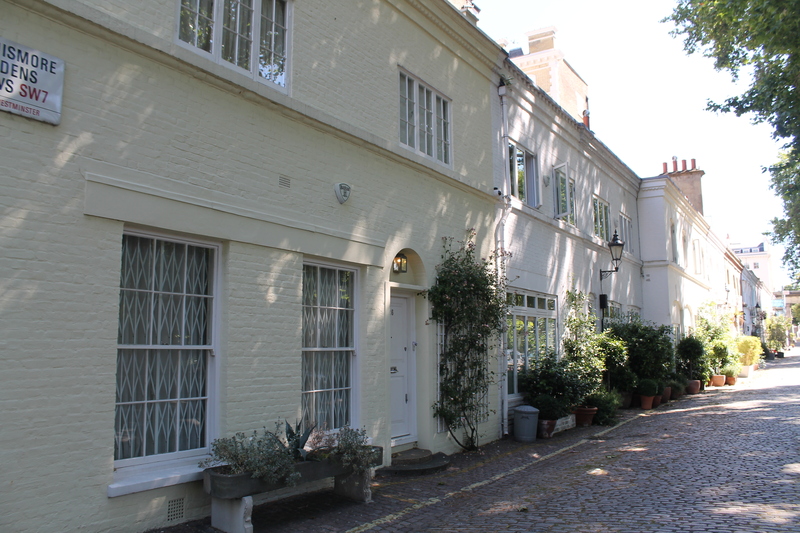 Running behind Ennismore Gardens is a row of mews houses (mews are converted stables and carriage houses). 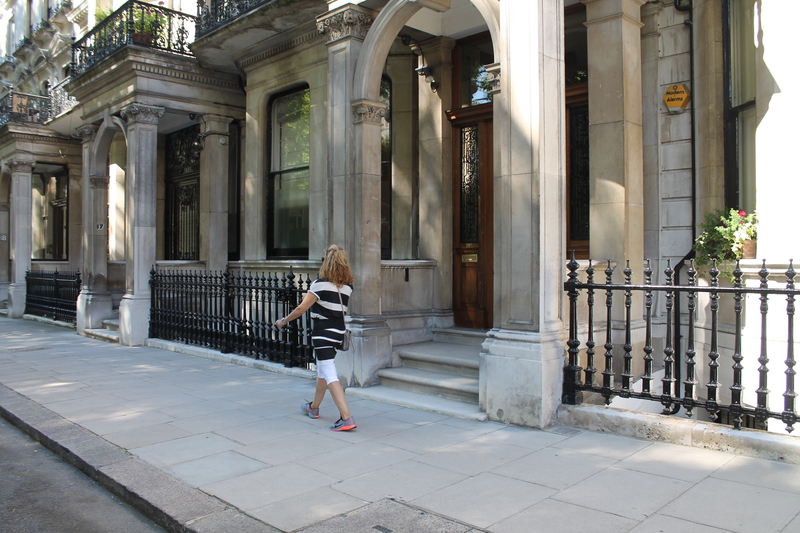 I had read that Michael Caine and Terence Stamp lived here (not together). I imagined how fun it would be to see one of them out watering his geraniums. But I saw no-one as I walked along the cobblestones. All I heard was birdsong and the distant drone of a passing airplane. 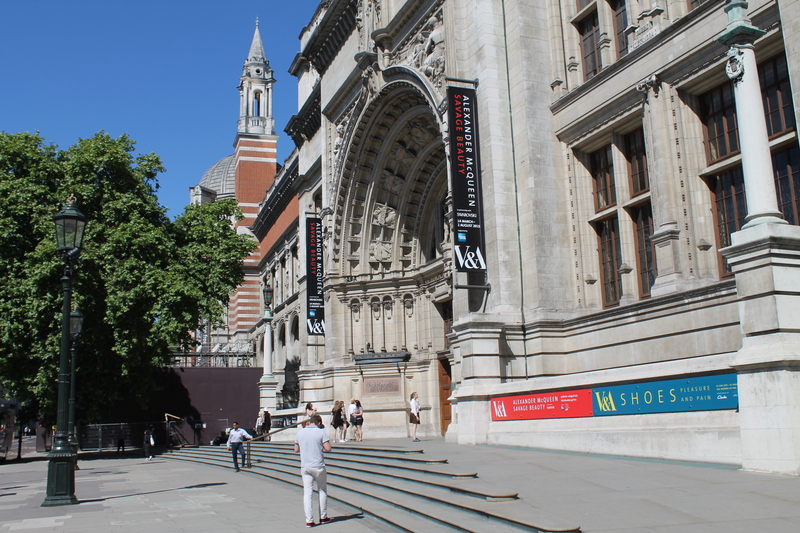 It was a beautiful sunny morning and I was on my way to my most favorite of all museums, the Victoria and Albert. 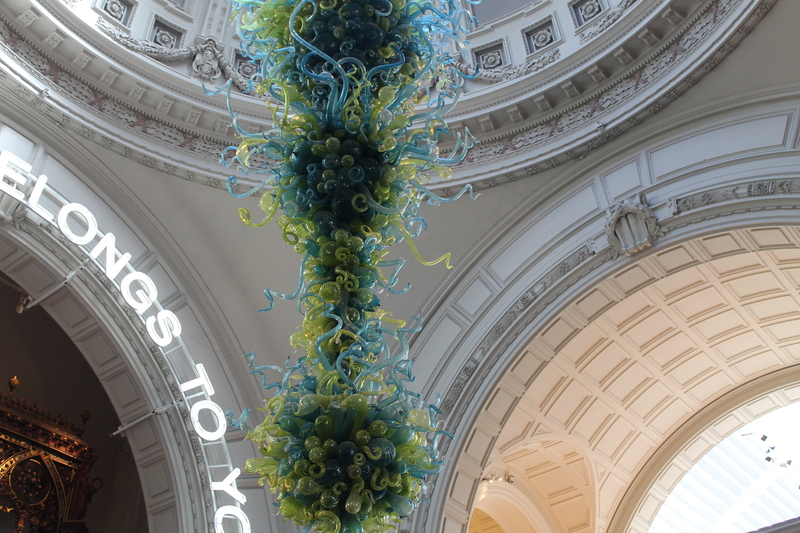 The V and A is one of London’s most beloved museums. 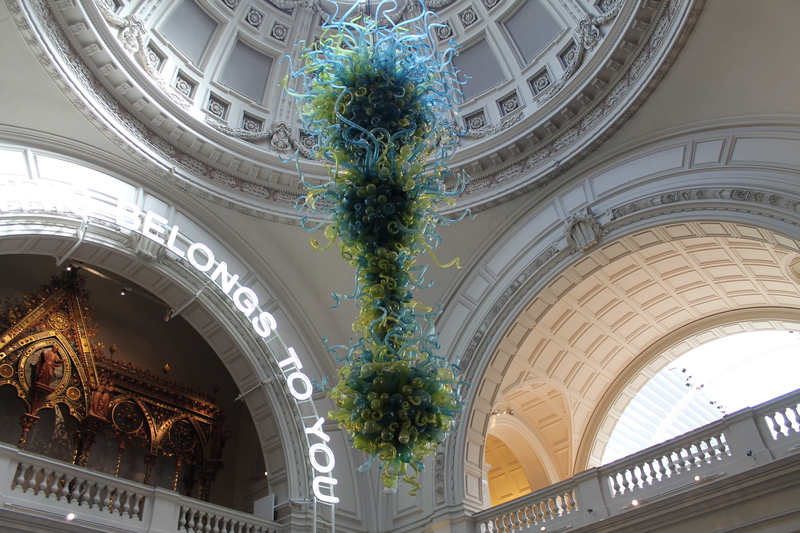 Founded in 1852 and named after Queen Victoria and Prince Albert, it’s also the world’s greatest museum of decorative arts and design. 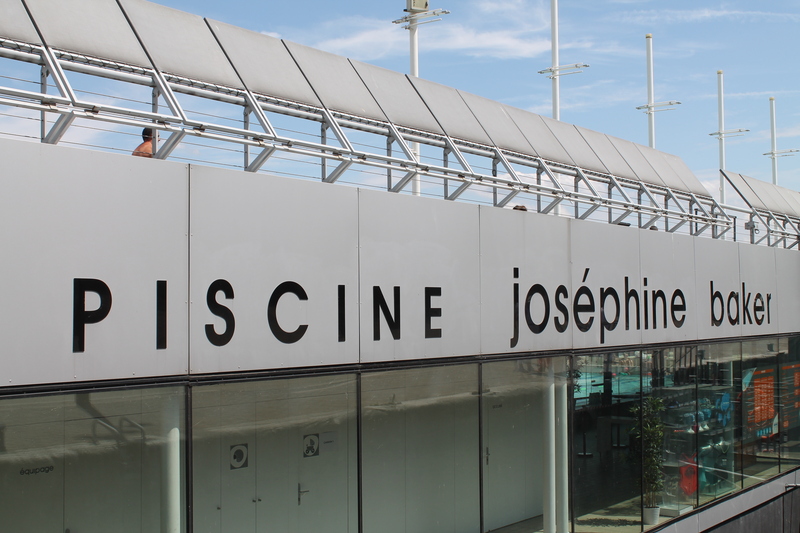 Entrance to the museum is free, however some exhibitions you have to pay for. The gift shop alone is worth visiting and there are several excellent restaurants and cafeterias on-site. 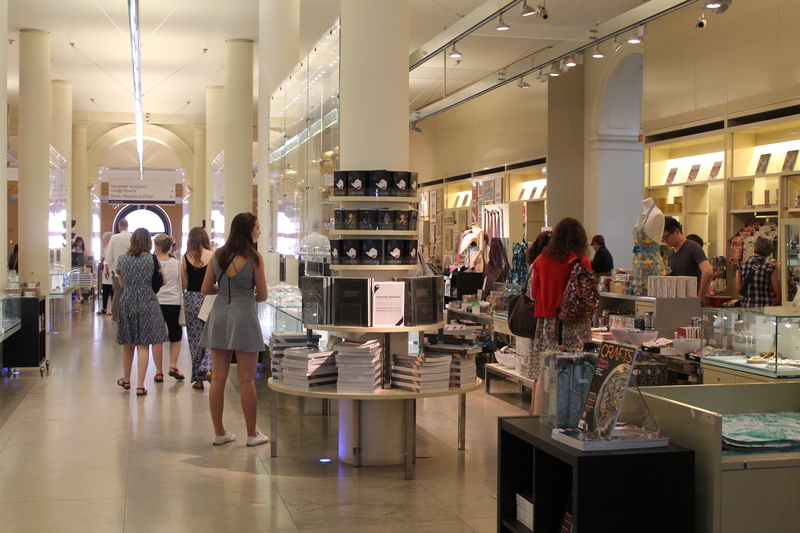 The gift shop showcases contemporary jewellery designers from all over the world. I purchased this ring for its originality. 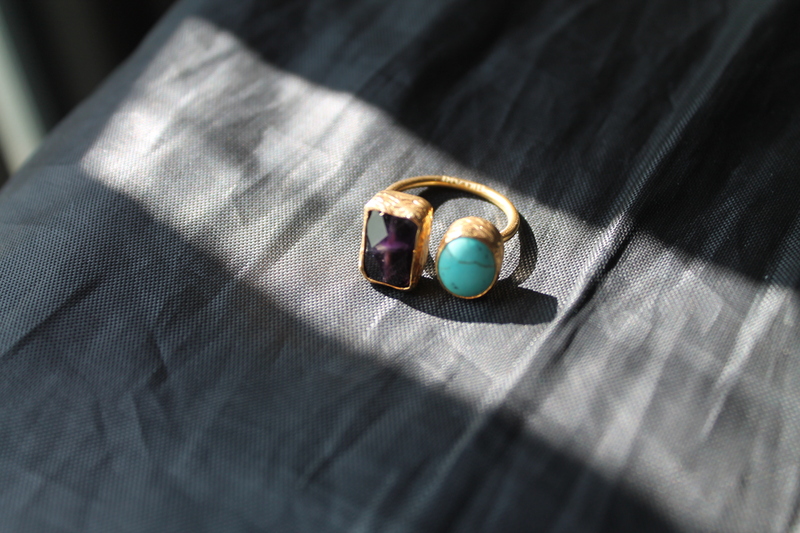 A fusion of Turkish and Colombian styles, the turquoise and magenta agate gemstones are set in gold-plated bronze. The artist’s name is Karla Diaz Cano. Every time I walk in to this museum, I admire the gorgeous sculpture of blown glass and steel that hangs in the grand entrance. The designer is named Dale Chihuly and he was inspired by Venetian chandeliers. The sculpture was made in Seattle. The last photo here is of the gift shop. 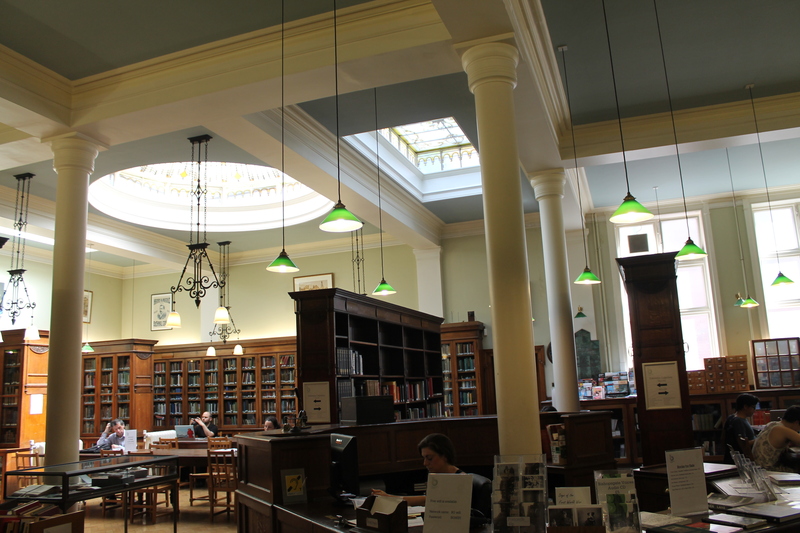 NEXT AND LAST POST COMING UP – a literary evening to celebrate the 150th anniversary of Alice in Wonderland; a grilled cheese sarny (sandwich) at Whole Foods (made for me by a Frenchman); and the noble-minded Bishopsgate Institute. I reluctantly left London after 6 action-packed days and took the Eurostar train to Lille in northern France. It was K’s birthday and, later in the month, his son’s birthday. 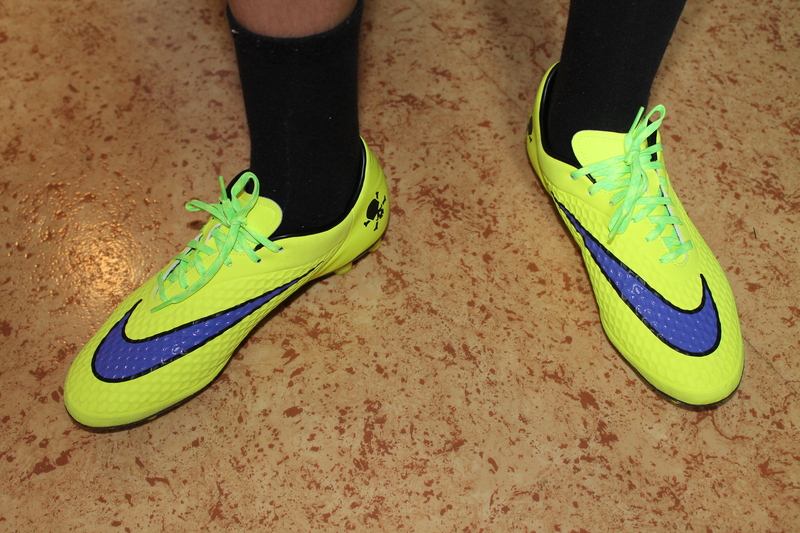 I had promised his son a pair of soccer shoes, so off we went to Go Sport and he chose these flashy Nikes. As for K, he received a large pomegranate from Borough Market and a jar of pickled onions from Marks & Spencer. The Eurostar high-speed network is very convenient. Travelling at 300 km/hour it links Paris – Lille – London – Brussels in just over 2 hours or under. While Paris sizzled under temperatures as high as 39°C, it was cool and breezy in London except for one day when it hit 36.7°C. 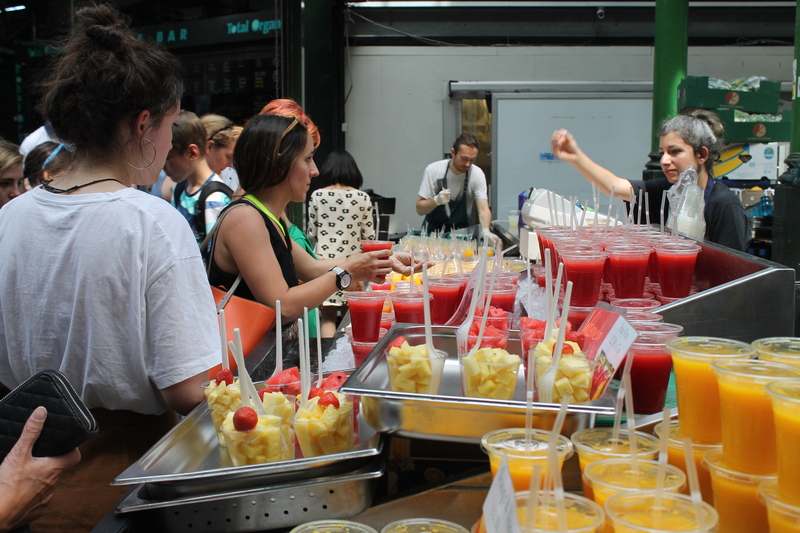 That was the day I went to Borough Market under the London Bridge. 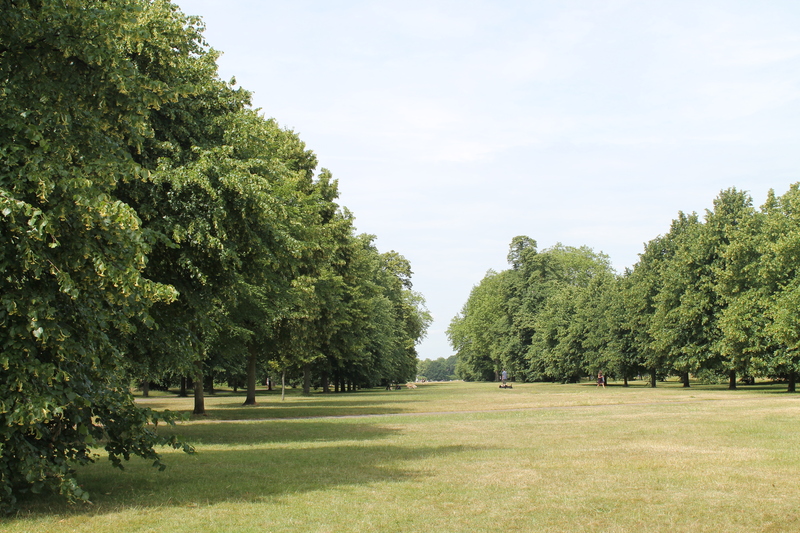 I love Kensington Gardens for its large open spaces, magnificent ancient trees (oak, horse-chestnut and elm, to name just a few) and its various monuments and fountains. 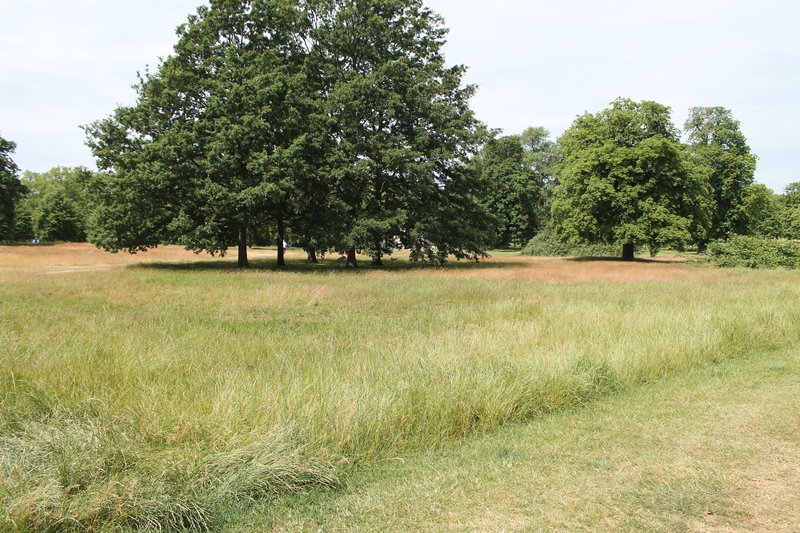 Located in the heart of London and adjoining Hyde Park, it covers 242 acres and was once the private gardens of Kensington Palace. A great place to ramble. 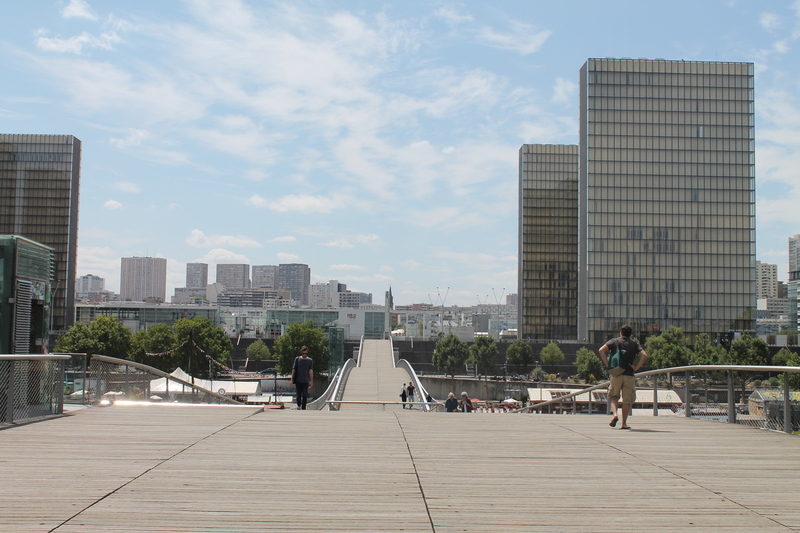 This amount of open space simply doesn’t exist in central Paris. 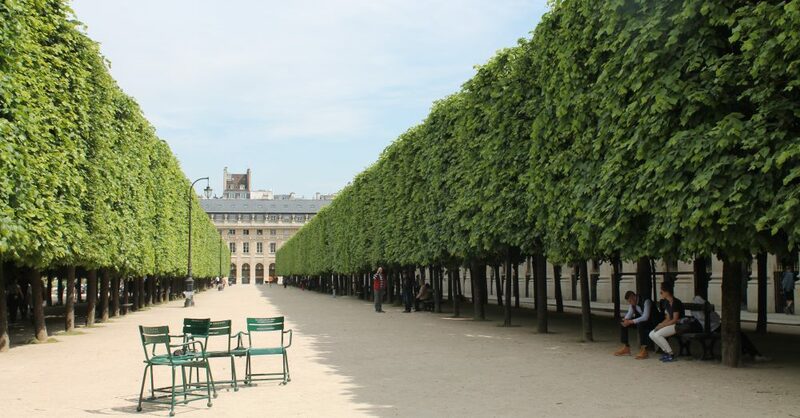 And I’ve never seen trees as big or old in Paris as you see here. Here’s the beloved Peter Pan statue located in the north end of the gardens, near the Long Water. 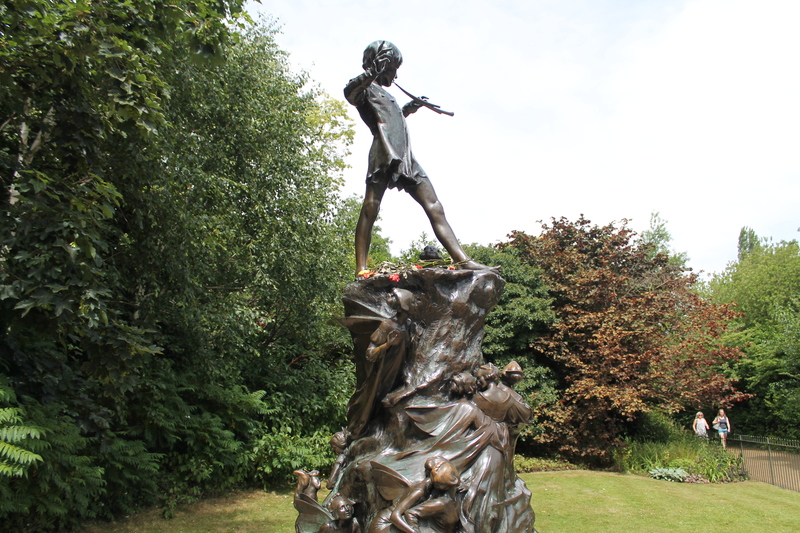 The bronze monument was commissioned by Peter Pan’s creator, James M. Barrie. It’s been standing at this very spot since 1912. 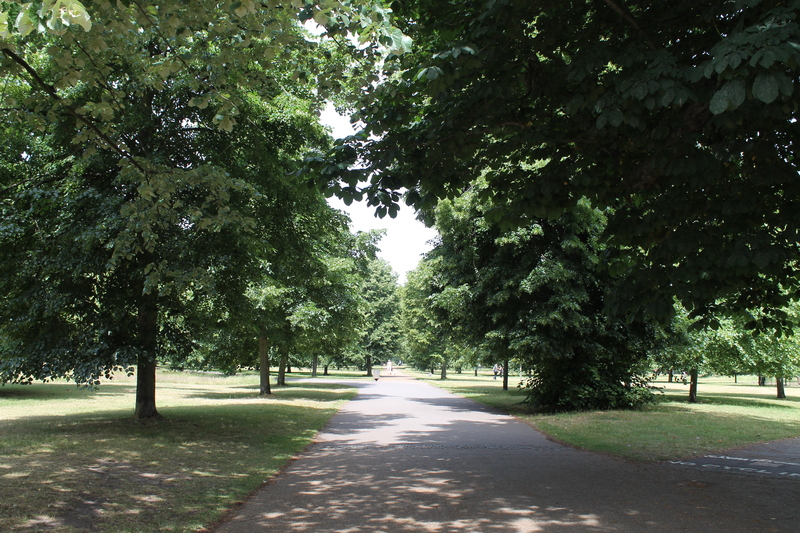 It’s been said that James Barrie met the boy who inspired him to create the story of Peter Pan here, in Kensington Gardens. 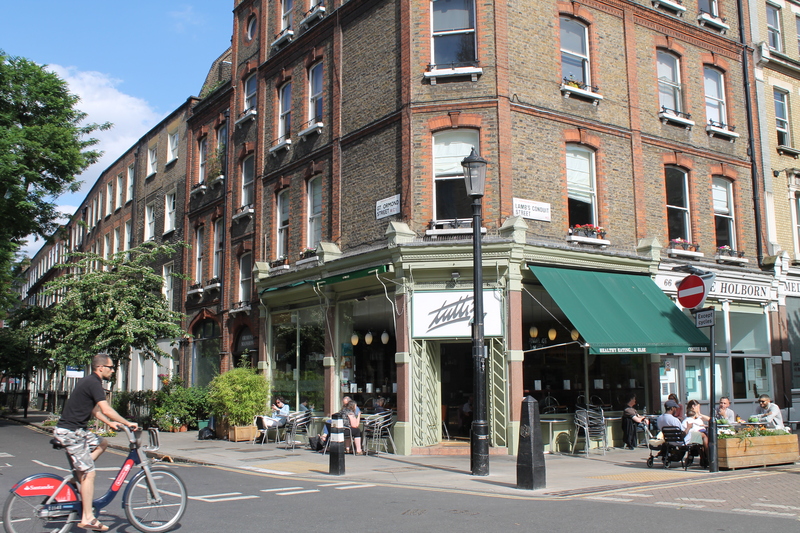 One reason for crossing Kensington Gardens is to get to my favourite organic supermarket-restaurant located at 42 Westbourne Grove. 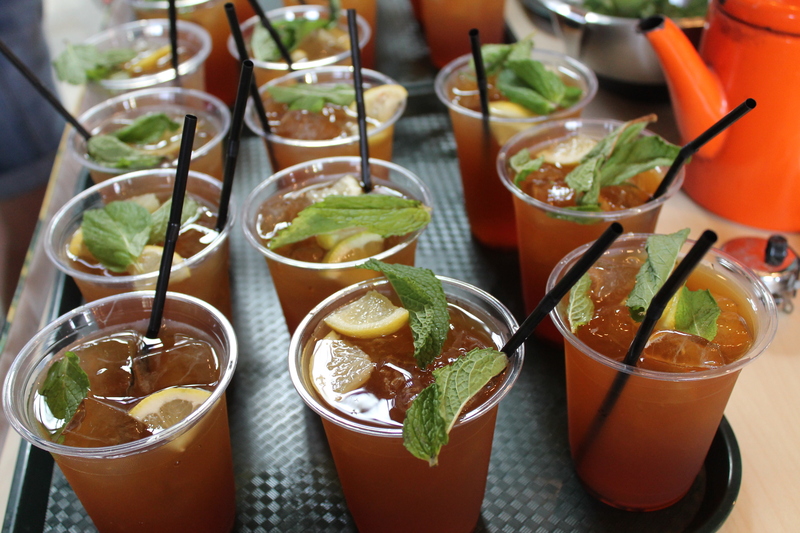 Planet Organic. 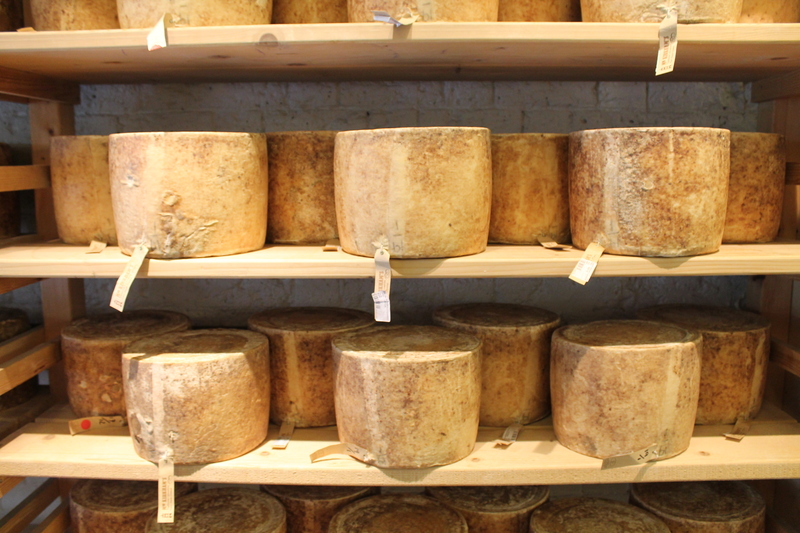 Not part of a chain like Whole Foods, it’s entirely independent. 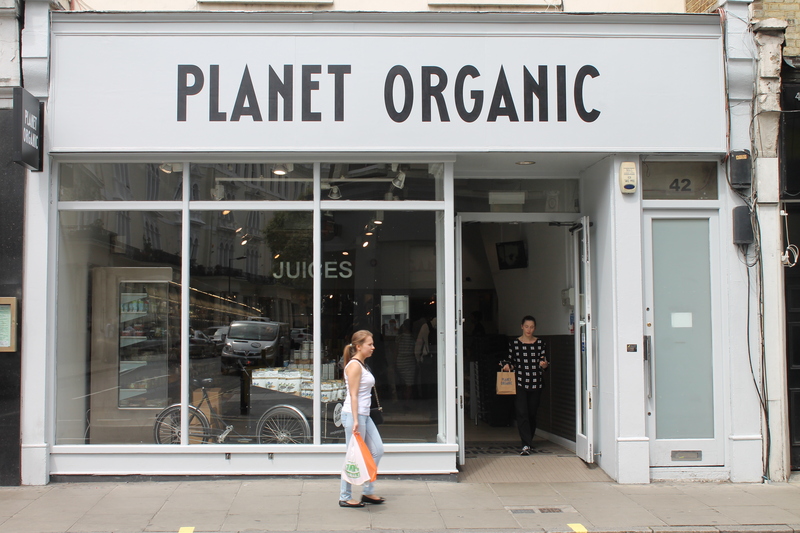 Here’s what they say – Planet Organic is a health food haven with organic fruit & vegetables, organic bread from artisan London bakeries, only organic meat and sustainable fish from British waters. 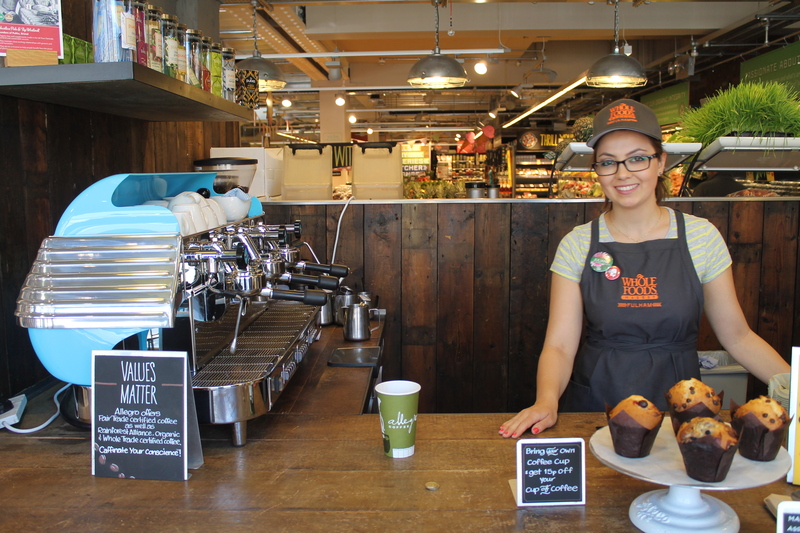 Our over-flowing groceries range is full of gluten-free, dairy-free, raw food and healthy options, while our Health & Bodycare department stocks the best natural beauty brands and a wide range of high quality health supplements. There’s also an in-house restaurant that whizzes up the most delicious smoothies, green drinks and energy drinks (I recommend Fatigue Fighter) as well as lasagna, curries, salads, etc. 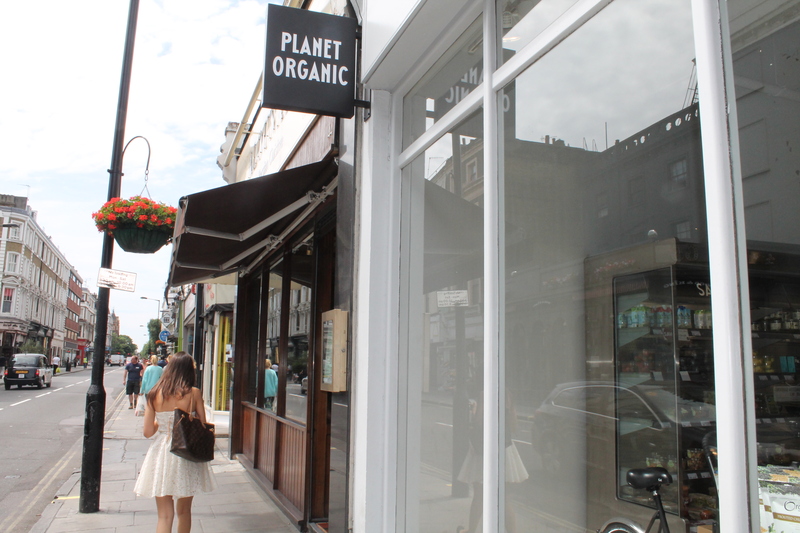 Another Planet Organic is located in Bloomsbury at 22 Torrington Place.